Purpose: Routine tooth polishing continues to be an integral part of clinical practice even though the concept of selective polishing was introduced in the 1980s. This procedure assists in the removal of stains and plaque biofilm and provides a method for applying various medicaments to the teeth, such as desensitizing agents. Use of traditional polishing methods, i.e. a rubber–cup with prophylaxis paste, has been shown to remove the fluoride–rich outer layer of the enamel and cause significant loss of cementum and dentin over time. With the growing body of evidence to support alternative tooth polishing methods, dental hygiene practitioners should familiarize themselves with contemporary methods including air polishing. The purpose of this review is to provide a comprehensive overview of recent advancements in air polishing. The effect of air–powder polishing on hard and soft tissues, restorative materials, sealants, orthodontic appliances and implants, as well as health risks and contraindications to air polishing are discussed. A comprehensive computer based search made use of the following databases: CINAHL, Ovid Medline and PubMed. Articles that were not available on these sites were requested from Wilson Interlibrary. Recent developments in air polishing necessitate an updated review of recent advancements. A literature search of air polishing was conducted to assess the scientific community's latest (1999 to 2012) recommendations for use. In this review, the effectiveness of new powders, overall effectiveness and efficiency of the technology, effects on hard and soft tissues, restorations, sealants, orthodontic appliances and implants, as well as health risks and contraindications to air polishing, will be discussed. Based on the current literature, this review will help the reader bridge information with clinical application by suggesting protocols for practice. Calcium carbonate (CaCO3) (Prophypearls™; KaVo, Charlotte, NC) is an air polishing powder with spherically agglomerated crystals. It is hypothesized that use of this mass of uniformly shaped round crystals will minimize surface abrasion when compared to the irregularly shaped particles found in other powders. At 45 μm, the particle size of the CaCO3 powder is less than NaHCO3, but similar in size to the particles in glycine.6 While study results indicate the efficiency and effectiveness of CaCO3 for stain removal, defects produced on root dentin were greater than that of NaHCO3.6 More clinical studies are needed to determine the effectiveness and abrasivity potential of CaCO3. Aluminum trihydroxide (Al(OH)3) (JET–Fresh™; DENTSPLY, York, Penn) is an alternative air polishing powder for patients on sodium restricted diets.17 Aluminum trihydroxide particles are harder but comparable in size to sodium bicarbonate.17 Johnson et al evaluated the effects of aluminum trihydroxide on certain restorative materials, including amalgam, gold, hybrid and microfilled composites, glass ionomers and porcelain.17 It was determined that aluminum trihydroxide should be avoided on cast restorations, luting cements, glass ionomers and resin composites. Inorganic salts have also been investigated as air polishing agents. Petersilka et al combined non–toxic, biocompatible, water–soluble organic and inorganic salts with varying grain sizes and crystal shapes to make four novel air polishing powders.18 Parameters included a combination of a 2 mm, 4 mm or 6 mm distance from the tooth with the powder and water setting on the APD set at low, medium or high. Mean root defects over all parameters for all 4 powders proved to be less than those produced by NaHCO3. At the time of this writing, these novel powder formulations are not commercially available products. A variety of air polishing models have been introduced to the market in the last 10 years. 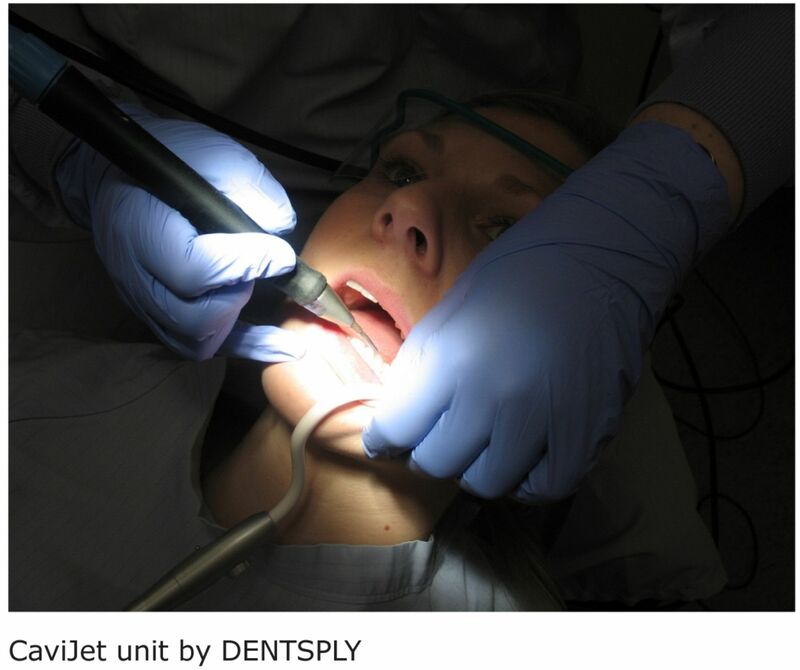 In addition to the traditional self–contained units, handpiece units now afford clinicians with a convenient, alternative delivery model.20 Recently, advancements in nozzle design have afforded more effective subgingival delivery.12 Few studies have been conducted on the effectiveness of these various models. Gutmann suggested following universal precautions, using high–volume evacuation instead of a saliva ejector and rinsing with an antimicrobial mouthwash before treatment to prevent any potential health risks.1 These protocols are still recommended today. Adherence to these protocols will insure that complications related to aerosols continue to be a rare occurrence. No adverse health effects related to glycine powder, calcium sodium phosphosilicate powder or calcium carbonate were reported in the studies reviewed for this paper. As with past reviews of the literature, this review of recent studies (1999 to 2012) of air polishing supports its use as a viable alternative to conventional polishing in today's contemporary practice. Air polishing has been found to be more effective than traditional polishing at stain and supragingival plaque biofilm removal. New, less abrasive powders are enabling the selective use of air polishing on cementum and dentin and a variety of restorative materials without concern for unnecessary damage. Traditional rubber–cup polishing requires the clinician to make treatment decisions regarding the abrasivity of the polishing paste, amount of pressure to apply and which surfaces to polish. Air polishing has the advantage of providing the clinician with a constant pressure, thereby eliminating this variable. However, studies indicate the importance of monitoring powder levels and refilling the powder chamber prior to each treatment session for optimal results. Aerosols are produced as a result of many procedures used in practice. While low volume evacuation may be used for limited air polishing, use of high volume evacuation (HVE) is recommended for all air polishing procedures. Standard infection control procedures, including universal precautions and use of an antimicrobial mouth rinse prior to procedures, suffice for adding this technology to the treatment appointment. Optimum angulation and distance of the air polishing nozzle to the tooth surface will avoid facial and tissue emphysemas and other gingival traumas. No other special requirements are needed to include air polishing as an option for patients. The growing body of research related to the effective removal of subgingival plaque biofilm is a significant advancement in air polishing. Glycine–based powder may become the air–polishing powder of choice due to its low abrasiveness on gingival tissues, tooth structure, restorative materials and its potential to clean both supragingival and subgingival surfaces.4,6–13,23,31,32,34,35,37 With additional research in this area, glycine has the potential to revolutionize the current dental hygiene recall appointment as we know it. This literature review has provided evidence of the usefulness of air polishing in contemporary practice. When used by a trained professional, air polishing is safe and effective.1,8–10,23 New polishing powders, such as glycine, are less abrasive and have the potential to transform the dental hygiene recall appointment for patients with minimal periodontal involvement. The advantage of subgingival biofilm removal that is more effective and efficient than hand instrumentation will have the added benefit of cost–effective, timely delivery of supportive periodontal treatment with the potential of improved treatment outcomes.4,8–10,12,16,23,37 Future research should continue to explore ways to reduce aerosol production, improve safety for all restorative materials and all patients, regardless of their medical condition. Sarah J. Graumann, RDH, BS, MDH, currently works in private practice at The Gorman Center for Fine Dentistry, North Oaks, Minnesota. Michelle L. Sensat, RDH, MS, currently works in private practice at Boger Dental, Plymouth, Minnesota. Jill L. Stoltenberg, BSDH, MA, RF, is an associate professor, Division of Dental Hygiene, Department of Primary Dental Care, School of Dentistry, University of Minnesota. This study supports the NDHRA priority area, Clinical Dental Hygiene Care: Assess the use of evidence–based treatment recommendations in DH practice.
. Air polishing: a comprehensive review of the literature. J Dent Hyg. 1998;72(3):47–56.
. Management of extrinsic and intrinsic stains. In: Dental Hygiene Theory and Practice. 3rd ed. Saunders; St. Louis. 2010. 511–528 p.
. A practice survey of hygienists using an air–powder system–An investigation. J Dent Hyg. 1991;65:433–437.
. Subgingival air–polishing in the treatment of periodontal biofilm infections. Periodontol 2000. 2011;55(1):124–142.
. Influence of air–polishing devices and abrasives on root dentin–An in vitro confocal laser scanning microscope study. Quintessence Int. 2010;41(7):141–148.
. The effect of air–polishing abrasives on wear of direct restoration materials and sealants. J Am Dent Assoc. 2010;141(1):63–70.
. Subgingival plaque removal in buccal and lingual sites using a novel low abrasive air–polishing powder. J Clin Periodontol. 2003;30(4):328–333.
. Effect of glycine powder air–polishing on the gingiva. J Clin Periodontol. 2008;35(4):324–332.
. Subgingival debridement efficacy of glycine powder air polishing. J Periodontol. 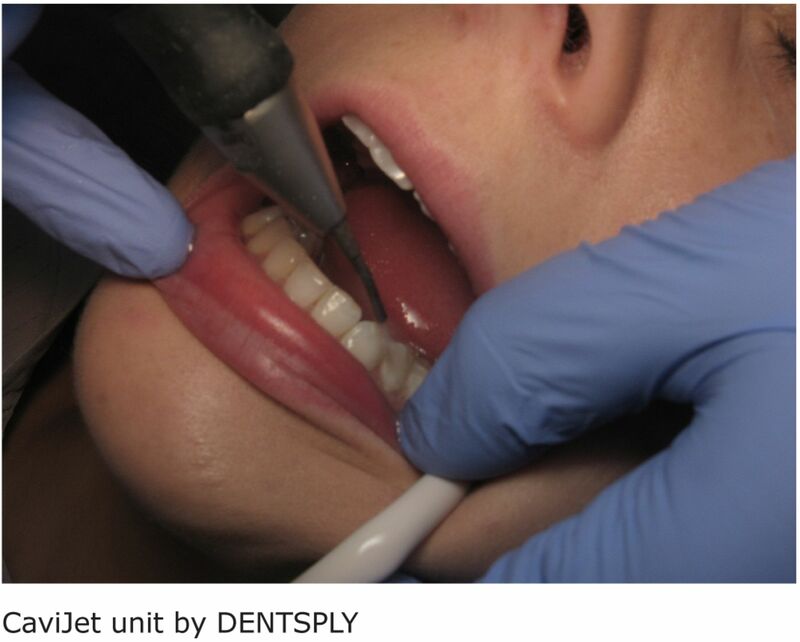 2007;78(6):1002–1010.
. Subgingival plaque removal at interdental sites using a low–abrasive air polishing powder. J Periodontol. 2003;74(3):307–311.
. Randomized controlled trial assessing efficacy and safety of glycine powder air polishing in moderate–to–deep periodontal pockets. J Periodontal. 2012;83(4):444–452.
. Subgingival debridement of periodontal pockets by air polishing in comparison with ultrasonic instrumentation during maintenance therapy. J Clin Periodontal. 2011;38(9):820–827.
. Dentine desensitization induced by prophylactic and air–polishing procedures: an in vitro dentine permeability and confocal microscopy study. J Dent. 2010;38(5):411–422.
. A clinical evaluation and comparison of bioactive glass and sodium bicarbonate air–polishing powders. J Dent. 2010;38(6):475–479.
. The effect of a commercial aluminum airpolishing powder on dental restorative materials. J Prosthodont. 2004;13(3):166–172.
. In vitro evaluation of novel low abrasive air polishing powders. J Clin Periodontol. 2003;30(1):9–13.
. Effectiveness of plaque indicators and air polishing for the sealing of pits and fissures. Eur J Paediatr Dent. 2010;11(1):15–18.
. An In–depth look at air polishing. Dimensions. 2010;8(3)32,34–36,40.
. Powder emission rates of four air polishing devices. J Clin Periodontol. 2002;29(8):694–698.
. Effect of air–polishing devices on the gingiva: histologic study in the canine. J Clin Periodontol. 2005;32(4):329–334.
. Subgingival plaque removal using a new air–polishing device. J Periodontol. 2010;81(1):79–88.
. Air polishing effect on bovine enamel and the posterior remineralizing effect of saliva. An in vitro study. J Appl Oral Sci. 2006;14(3):193–197.
. Root defects following air polishing. An in vitro study on the effects of working parameters. J Clin Periodontol. 2003;30(2):165–170.
. Abrasive effect of air–powder polishing on smooth surface sealants. J Orofac Orthop. 2009;70(5):363–370.
. Effect of sodium bicarbonate air abrasive polishing on attrition and surface micromorphology of ceramic and stainless steel brackets. Angle Orthod. 2012;82(2):351–362.
. Abrasiveness of an air–powder polishing System on root surfaces in vitro. Quintessence Int. 2001;32(5):407–411.
. Severe enamel abrasion due to misuse of an air polishing device. Int J Dent Hyg. 2006;(4):209–212.
. The influence of air polishers on tooth enamel. An in–vitro study. J Orofac Orthop. 1998;59:1–16.
. Effect of particle diameter on air polishing of dentin surfaces. Odontology. 2010;98(1):31–36.
. The characterization of dentin defects produced by air polishing. Odontology. 2012;100(1):41–46.
. The comparison of the effects of three types of piezoelectric ultrasonic tips and air polishing system on the filling materials: an in vitro study. Int J Dent Hyg. 2007;5(4):205–210.
. Atomic force microscopy in vitro study of surface roughness and fractal character of a dental restoration composite after air–polishing. Biomed Eng Online. 2010;9:59.
. Effect of air polishing with glycine and bicarbonate powders on nanocomposite used in dental restorations: An in vitro study. Int J Periodontics Restorative Dent. 2001;31(5):e51–56.
. In–vitro study of surface changes in fixed orthodontic appliances following air polishing with Clinpro Prophy and Air–Flow. J Orofac Orthop. 2009;70(5):371–384.
. Non–surgical treatment of peri–implantitis using an air–abrasive device or mechanical debridement and local application of chlorhexidine: a prospective, randomized, controlled clinical study. J Clin Periodontal. 2011;38(9):872–878.
. Sudden facial swelling: subcutaneous facial emphysema secondary to use of air/water syringe during dental extraction. Singapore Dent J. 2000;23(1 Suppl):42–44.
. Pneumomediastinum and subcutaneous emphysema after dental extraction detected incidentally by regular medical checkup: a case report. Oral Surg Oral Med Oral Pathol Oral Radiol Endod. 2009;107(4):33–38.
. Bilateral pneumothorax with extensive subcutaneous emphysema manifested during third molar surgery. A case report. Int J Oral Maxillofac Surg. 2000;29:355–357.
. Subcutaneous cervical emphysema induced by a dental air syringe: a case report. Int Dent. 2007;57:28628–8.
. Soft tissue cervicofacial emphysema after dental treatment: report of 2 cases with emphasis on the differential diagnosis of angioedema. Arch Dermatol. 2005;141;1437–1440.
. Subcuteanous emphysema and pneumomediastinum secondary to dental extraction: a case report and literature review. Kaohisiumg K Med Sci. 2006;22:641–645.
. Assessing the clinical effectiveness of an aerosol reduction device for the air polisher. J Am Dent Assoc. 1999;130(9):1354–1359.